"What a difference one person with a vision can make," said Chancellor George Blumenthal who delivered remarks at the event. Matthew Raiford, "CheFarmer," alum, and powerhouse, was honored Saturday, September 12 at the Center for Agroecology and Sustainable Food Systems (CASFS)'s annual Farm to Fork dinner, a benefit he founded as an apprentice in 2011 to support future aspiring farmers in the Ecological Horticulture program. Since then, the Farm to Fork dinner series has supported more than 150 apprentices through scholarships and subsidized meal plans. When the next class of apprentices arrives in spring 2016, the event will have helped almost 200. 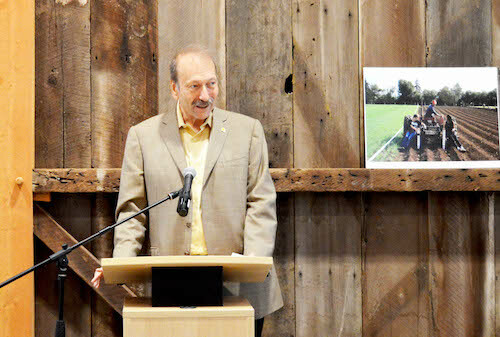 "It's about paying it forward," said Raiford to guests, who included current and former apprentices as well as Alec and Claudia Webster, whose generous donation kickstarted the renovation for the newly restored historic Cowell Ranch Hay Barn where Saturday's dinner was held. UC Santa Cruz Chancellor George Blumenthal also attended, remarking that "UCSC has a long tradition of being a place where visionaries can make their mark. ... That has certainly happened here." When Matthew Raiford visited the campus farm as a student from the Culinary Institute of America in 2005, he had no idea he would return six years later as an apprentice. He certainly did not anticipate that one day he would help make it possible for hundreds of future apprentices to attend the program. Raiford came to CASFS after he and his sister Althea inherited Gilliard Farms, their family farm in Brunswick, Ga. The land had been in the family since 1874 and had ties to post-Civil War legislation that helped African Americans receive property rights. To the Raifords, the farm is an important historic and family legacy. But neither sibling had any experience farming. The farm was inactive. At the time, Raiford was a successful chef in Washington, D.C., and catered at the House of Representatives. Before that, Raiford served nine years in the U.S. Army. Althea had just retired from a 20-year service in the Navy and was about to pursue a master's degree. They did realize one thing: "One of us had to learn farming," said Raiford. As veterans, Matthew and Althea sought counsel through the Farmer Veteran Coalition (FVC). 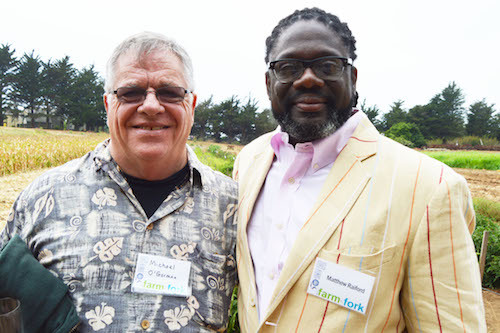 Michael O'Gorman, FVC founder whose organization had origins in Santa Cruz, encouraged Matthew to apply to CASFS to learn organic farming. The FVC offered Raiford a scholarship to attend the competitive training program in ecological horticulture. "I owe a lot of where I am right now thanks to the FVC," said Raiford about the scholarship that enabled a life-changing experience for him at CASFS. Raiford shared how field production manager Liz Milazzo stressed how you can only do so much until you cannot do it well. Apprenticeship coordinator, Diane Nichols, christened Raiford as the "CheFarmer," his now infamous title that recognizes his culinary and agricultural talents. Farm manager Orin Martin taught him everything about composting, which was the first task Raiford took on when he returned to his farm ("I make compost more than I farm," joked Raiford). To Raiford, the scholarship also marked the first movement in paying it forward. He wanted to make sure the next generation of farmers could benefit from the same lessons he learned. So Farm to Fork was born. "You are lending a hand to someone else," said Raiford about the event's theme which centers on making it better for the following cohort of apprentices. Raiford continues to pay it forward. He recruited two apprentices from the 2015 class for an advanced internship to learn site and field management at Gilliard Farms. "It's come full circle," said Raiford. "Keep it going. Never let that stop."